BUYERS FINANCING FELL APART!!! 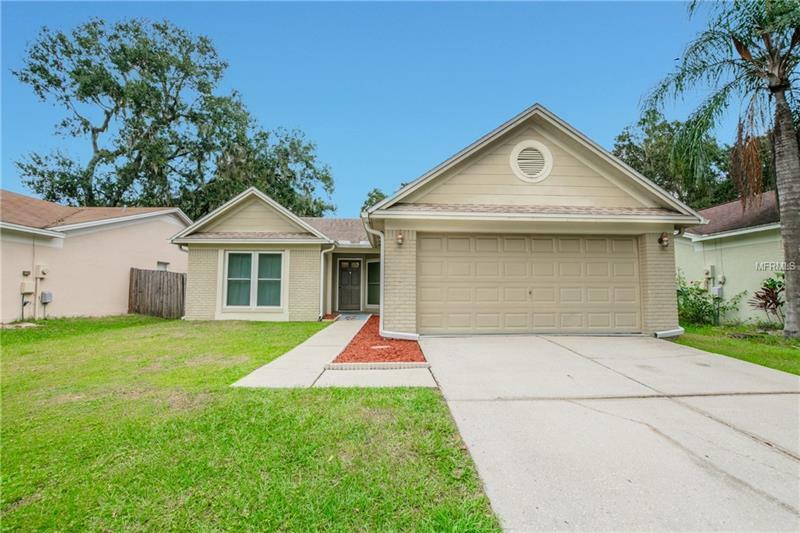 You don’t want to miss out on this beautiful 3 bedrooms, 2 bath home located in the heart of Valrico in the desirable Oakdale Reserve community. The home features a spacious open floor plan with vaulted ceilings in the living and dining area, double pane low-e windows for energy efficiency, a covered porch, laminate floors in the main living areas, tile in the wet areas, carpet in the bedrooms. & recently had a COMPLETE RE-PIPE. The kitchen features a pass through window/breakfast bar that overlooks the main living & dining room. Sliders in the living room lead to the cover and screened OVERSIZED porch that overlooks the private backyard. The oversized master suite has a large walk-in-closet & master bath has a single vanity and tiled shower. The two guest rooms are generous in size and share a bathroom. The roof was replaced in 2010, ALL WINDOWS WERE REPLACED WITH LOW-E DOUBLE PANE for energy efficiency, A/C was replaced in 2011, re-pipe was 2016!! This home is move-in-ready! Great locations! Just minutes from Hwy 301, I-75, I-4, Crosstown Expressway, MacDill AFB, A-rated schools, shopping, dining, entertainment and all that the Tampa Bay area has to offer. Don’t miss this must see property! Copyright © 2019 Mid Florida MLS. All rights reserved. The data relating to real estate for sale on this web site comes in part from the Internet Data Exchange Program of Mid Florida MLS. Information provided is for consumer's personal, non-commercial use and may not be used for any purpose other than to identify prospective properties consumers may be interested in purchasing. Assist-2-Sell The Eshack Team participates in the MFRMLS Internet Data Exchange (IDX) program, allowing display of other MFRMLS broker's listings on this site. However may not include all listings currently available. Information is deemed reliable but not guaranteed. Information last updated at 2019-04-25 08:39:03.